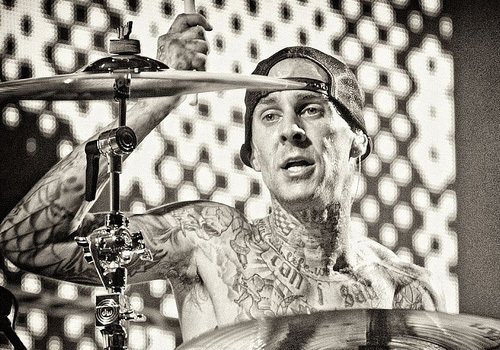 Travis Barker, a household name for music worshippers, is the drummer of the band, Blink-182. 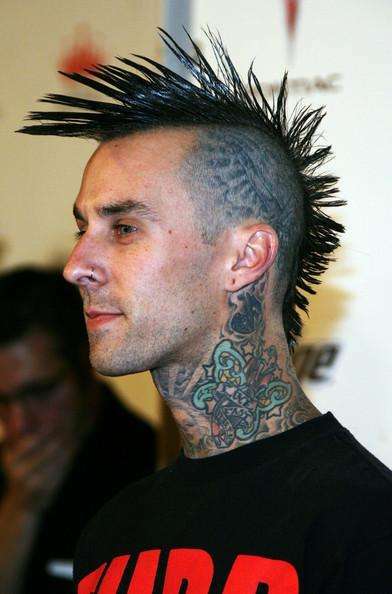 Also famous for his tattoos, he gives the reason for getting them, so he could never go and get a normal job. He could never become just another average person. The tattoos on his body would of course never allow him to go get a normal job. 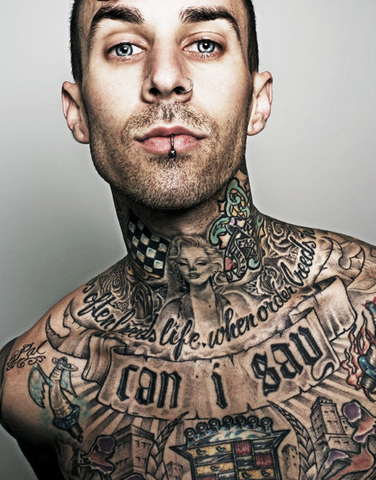 No one would hire someone who has ink all over their body. So, IT WAS EITHER MUSIC OR NOTHING. He had no plan B! Pretty daring, huh? Let’s learn about his tattoos here. Barker’s first tattoo, unfortunately, “burned off” during a plane crash. It was his nickname, “Bones” and had a symbol of a hard-core band that he really liked right above it. 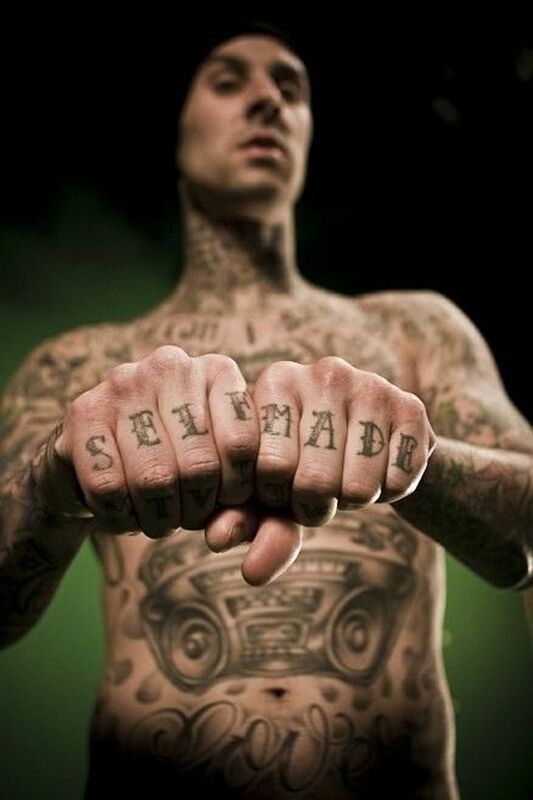 Barker has a Chevy Symbol on the upper part of his right hand with a rose and his daughter’s name, Alabama. 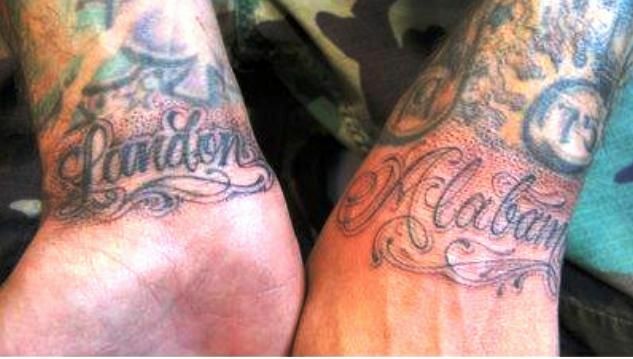 He has his kids’ names on his both wrists, Alabama, his daughter and Landon, his son. He has the word ‘hope‘ written on his back. This tattoo draws inspiration from Descendant’s song and is also a tribute to the positive things that happened to Travis after his mother’s death. 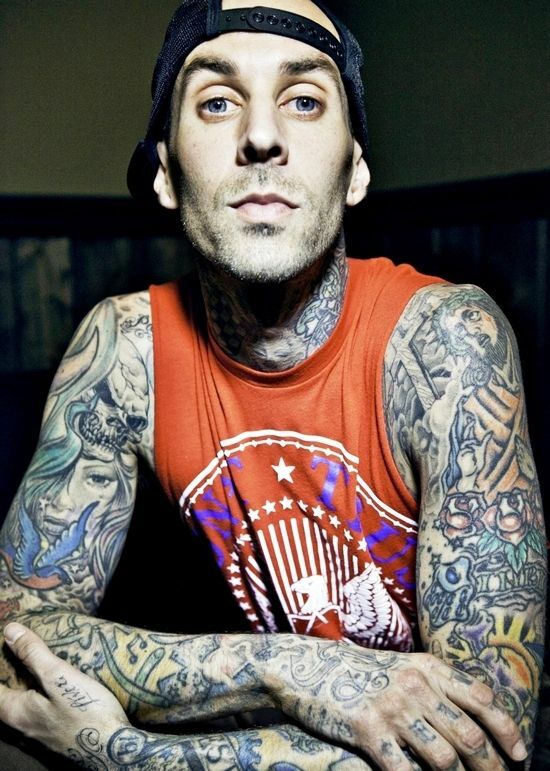 Travis has a spider web tattoo on his right arm. 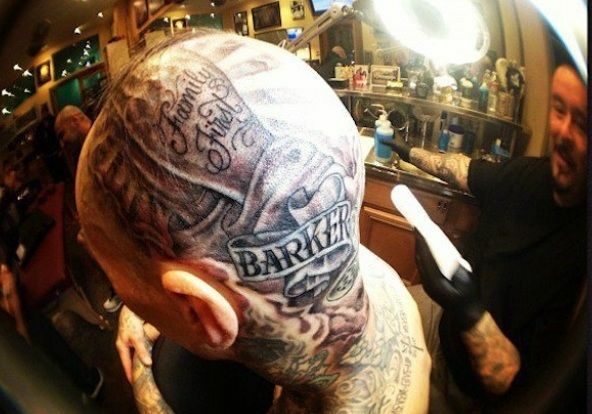 His head tattoos were collaborated by famous black & grey tattoo masters, Chuey Quintanar, Franco Vescovi & Mister Cartoon. It took 30-35 hours to finish. Travis has portraits of his dad, mom and two kids on his back along with this “Family Over Everything” is also written there. As a tribute to his vegan restaurant, Crossroads (and being a vegan himself! 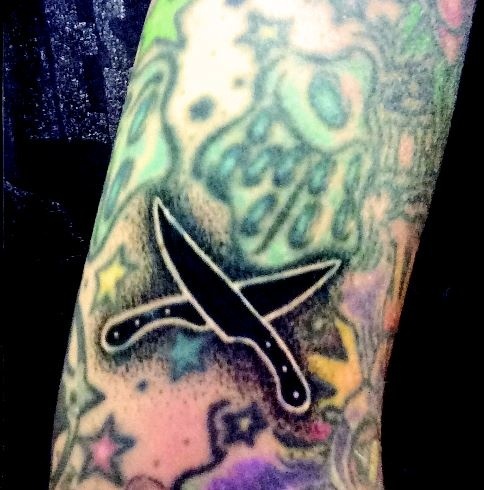 ), he got a tattoo of two crossroad knives during the first year of the restaurant’s opening. He loves cars and racing. 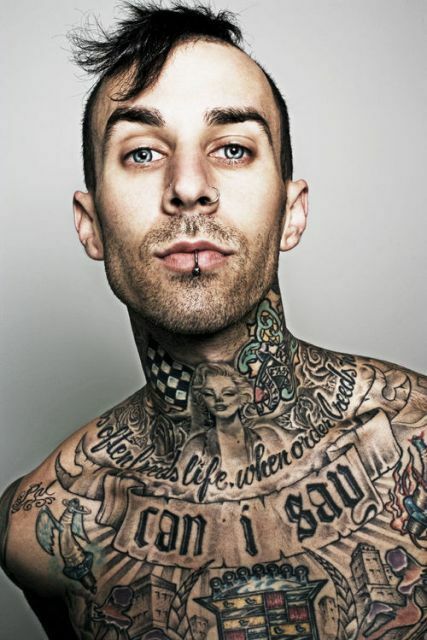 This is clearly shown with racing flags tattooed on his neck. 20. Chaos Often Breeds Life…. One of the sweetest things is that he and his dad each get ‘pal’ tattooed. Pal is the name they used for each other since Travis’s childhood. 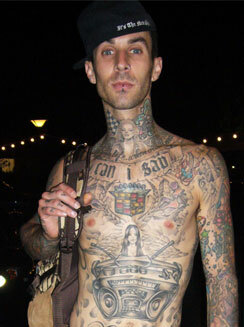 Travis has tattooed the word “Lover” on his stomach below boom boom box. 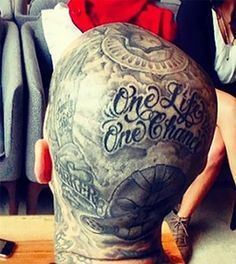 “Family First” is inked on his head which shows his love for his family again. 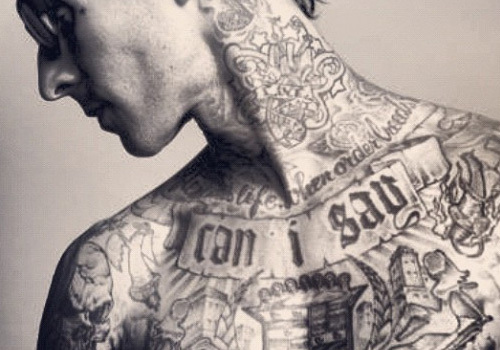 The words “Live Fast Die Fun” are inked with a colourful design on his neck. 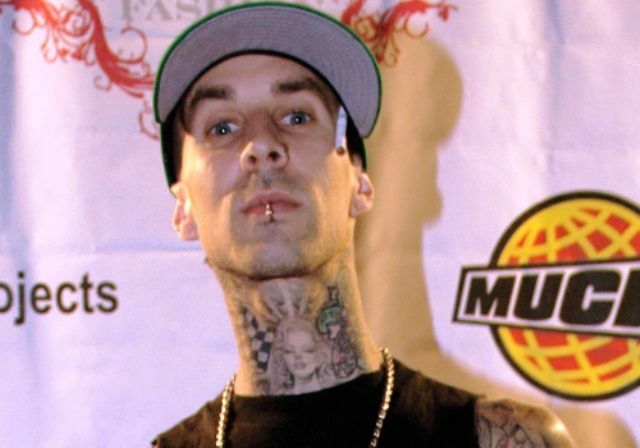 One of Travis Barker’s several tattoos on his right arm is a blue bird.